With the fall TV season well under way, we thought it might be fun to take a look at how two TV shows that feature characters who work in television news chose to portray TV station facilities in their sets. This CBS comedy starring Will Arnett follows the life of Nathan Miller, a TV reporter in the Leesburg, Va. market. Miller works at WXDN-TV, a fictional TV station in what is basically a fictional market (Leesburg, Va. is classified as part of the Washington, D.C. DMA). The show’s TV station set includes a windowed editing room with a few workstations outside of it, as well as a small conference table. It’s not clear if this area is meant to be the complete newsroom or just an in-studio work area. On the other side is a break area with a coffee station. All of these are placed in rather close proximity to the news set, which seems like it could cause some noise issues, though it’s certainly not implausible for a TV station to be arranged like this in a smaller market. The workstations and break area also seem to encroach a bit on the studio floor area where cameras might be positioned. The news set itself is simple but well done — featuring an oval anchor desk situated in front of a printed backdrop of a photo of what is presumably downtown Leesburg. Horizontal metal elements are placed above and below the backdrop, as well as on the side narrow side walls, which are finished in wood laminate and feature a colored rendition of the station’s logo printed on plastic sheets and mounted on the wall with standoffs. Past this area, repeating horizontal metal bars front a dramatically lit wall. 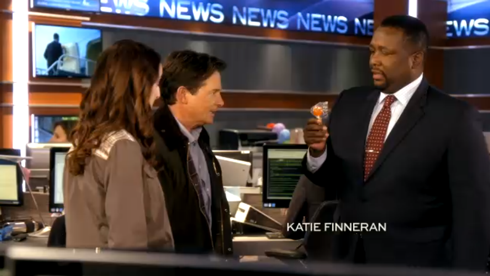 As is common with news sets that appear on TV shows, some of the scaling is a bit off on the set, however. For example, the anchor desk seems a bit low and perhaps too close to the camera center wall. The entire set also feels a bit too tall for the studio. Overall, the set reflects the feel of what a small market station might look like. Fox plays Michael Henry, a former news anchor who has returned to work at WNBC-TV after being diagnosed with Parkinson’s disease. The TV station set on this show is a sprawling newsroom with an adjacent studio. The newsroom area includes muted grayish-blue and wood banded walls with plenty of monitors as well as a video wall. The newsroom entrance features an oversized “4 New York” logo mounted on the wall while printed graphical backdrops are scattered throughout the space. These backgrounds, which are done rather jarring shades of blues and dark brown (or is it orange?) and are rather typography heavy, make the newsroom feel a bit dated. 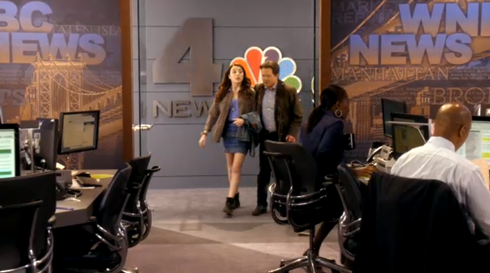 Large glass windows look into the neighboring studio where the fictional version of the WNBC-TV set resides. “The Michael J. Fox Show” designers opted to draw inspiration from the reeal WNBC-TV set, keeping some elements while making some notable changes. The anchor desk is nearly identical to the real one, though certainly lacks some of the details, and production designers mimicked the vertical “windows” behind the anchor desk, though the metal accents are toned down and it’s fairly clear the monitors have been replaced with dura. 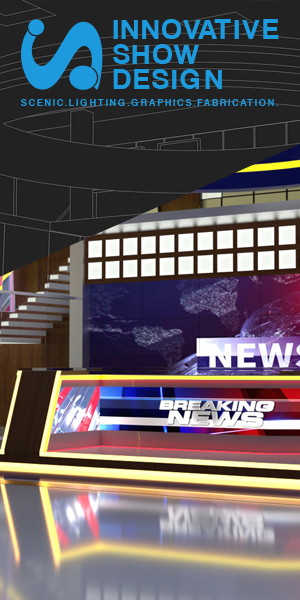 The show forgoes the real WNBC-TV’s colored backlit panels and bold blue walls, while adding an elaborate header element above the anchor desk that includes a printed graphic along with monitors. 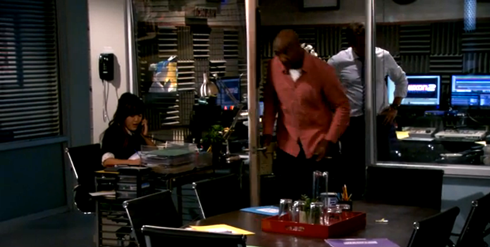 Designers did incorporate some white panels into the walls around the set, however. On this set within a set workstations are also added in front of the anchor desk area, something that isn’t there in real life. 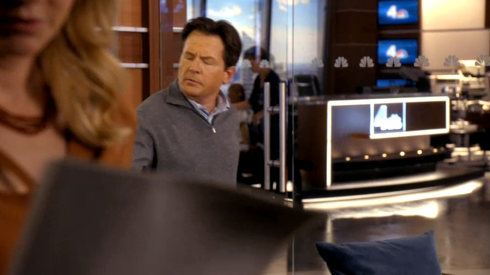 It’s also worth noting that the WNBC-TV studio on “The Michael J. Fox” show is directly beside the newsroom, similar to how the WNBC-TV set once was. 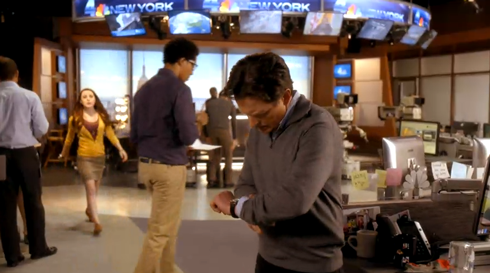 However, the set doesn’t use the newsroom as a backdrop as that version of the NBC New York set did.